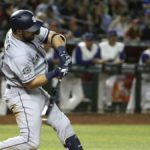 In speaking to Nick Margevicius, it is clear that his goal is to attack hitters and make them uncomfortable in the box. Here is what else the left hander told me as we discussed the game of baseball and his passion for it. 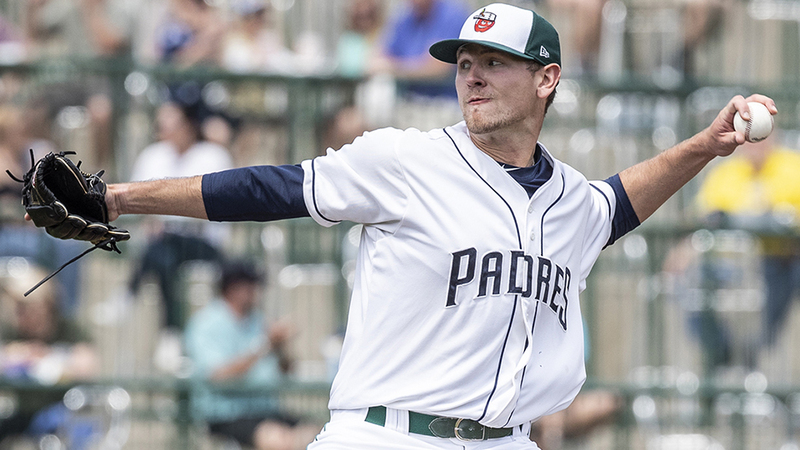 I have been lucky enough to build a pretty decent relationship with Padres’ left-handed pitching prospect Nick Margevicius. The two of us hit it off fairly well when we first spoke in February and we have kept in contact since. When I first heard of his promotion to the California League, I was extremely excited for him and his family, as I knew how hard he worked on his craft. Margevicius is a routine-oriented person and we all know that type of personality takes you far in the game of baseball. Nick and I spoke for about 30 minutes prior to a Storm game last week. Here is a glimpse into our conversation. The first thing the two of us talked about was how this last calendar year has been a crazy experience for the pitcher. 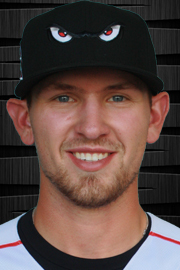 He was selected in the seventh round in 2017 out of Rider University, and a little over one year later he is in the California League. He was impressed with his time in Arizona to start his career after he was drafted. He spent five games in 2017 with the AZL Padres and recorded a 1.42 ERA. He was then sent to Tri-City to close out the season. “I think last year I was really trying to get accustomed to the whole thing (after the draft). I was getting used to the everyday kind of grind of it. I really like my experience in Arizona last year before I went to Tri-City. 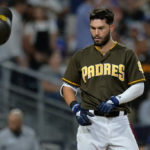 A lot of people are anxious to get out of Arizona, but I really enjoyed my time there because the facility is great… I got to work with and meet a lot of people in the organization there.” He did not sulk in starting out his career in Arizona. Instead, he put his nose to the grindstone and got the job done. You have to respect that. Margevicius was very successful in the Midwest League. I asked him about his time as a TinCap.”I loved my time in Fort Wayne. I am from the Midwest, so my parents were able to come out to almost all my starts. It was great for them to be able to see me. I cannot say enough about the facility and the group there. The coaching staff was great. It’s sad leaving those guys as they battle for a playoff spot. I wish them the best of luck.” He had a great time in Indiana, and is sad about the group of players he left there. He and I went through most of the players on the offensive side on the squad. He has glowing things to say about all the teenage prospects that are progressing in Fort Wayne. 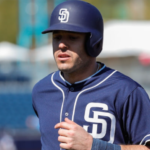 A little over a year ago, I spoke to Eric Lauer in Lake Elsinore. 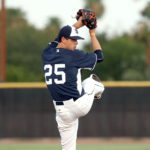 He and Joey Lucchesi were members of the Storm in 2017. I wanted to know what Nick thought about that duo and the fact they have progressed so fast. “Eric Lauer was from my area. I played against him in high school. I’m familiar with him from them. I was excited when I got drafted, as we have similar backgrounds. Those two guys specifically got me excited though. Both are lefties, college guys and look what they are doing. 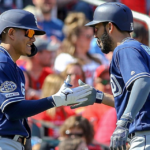 The Padres are advancing then and it gives you a blueprint of sort of what you have to do within the organization. It’s really good for me to keep track of them and see how they are doing.” Nick doesn’t know the fellow left handers very well but, in time, he may be able to pick their brains a bit. Nick Margevicius is the type of pitcher who attacks hitters. He enjoys putting hitters in a defensive count and takes pride in throwing strikes. We spoke about the art of pitching and he told me this about his “style” of pitching. “My approach has always been to attack hitters. My roommate here is Chris Baker and we were talking about how hard it is to hit a baseball, on the way home the other night. The mechanics of hitting a baseball is not an easy thing to do. You have to be on the offensive as a pitcher. Your job is to put them (hitters) on their heels and make them react to what you are throwing. I don’t like to give up free bases. I hate the idea of giving up any free bases.” The two of us went further into this, as we talked about getting ahead and his philosophies on the matter. Some things need not be shared, but he is very advanced in his way of approaching each hitter. In speaking about his repertoire, he told me that he is confident in all his pitches. “I attack with all my pitches. I attack with the curveball. I attack with the changeup. That’s an approach that has grown on me. I don’t want to throw me a get me over pitch. I want to throw my best pitch every time. You need to show hitters you have that pitch and get in their heads a little bit. Pitching that way has helped me out a lot this year.” This is something he has worked on this season as he fine-tunes his thought process. In throwing to hitters when you aren’t blessed with a big fastball (Margevicius tops out in the low 90’s), you have to be creative and utilize all your pitches. I asked Nick about the success he has using his curveball this season. “I think it (success) comes off of the fastball. Being able to throw that pitch where I want to is big. That is what allows me throw other pitches in different counts. I change speeds on the curve and sometimes early in the count, I might baby the pitch a little bit and it comes out slower. When I am attacking hitters it comes out a bit harder. That is something I have been working on. I like to establish both sides of the plate with my fastball. 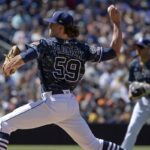 The fastball inside really allows me to throw my changeup outside to right handed hitters.” He has a proper approach and is able to simply execute it. The left hander is all about being prepared as he continues his understanding of the game. Here is a little more about how Nick attacks hitters. “I don’t throw real hard. There are guys that throw 97-98 mph. There are a lot of guys that throw real hard and I just don’t do that. I have to pitch with my fastball up in the zone and throw an offspeed pitch off of that to make my fastball look faster to the hitter. I think that is what my curve has allowed me to do this year.” He may have changed his though process slightly in recent months, but the game of baseball is still the same sport he has played all his life. Separating each hitter? I asked him to elaborate on that for me. “What I mean by separating each hitter is treating them as independent events. Whatever happens to one hitter, that’s it. The only thing you can control is the next hitter. Some people like to say you can only control the next pitch, but I like to say the next hitter or next out. 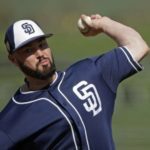 I may give up a weak base hit to leadoff an inning, but I will make a better pitch on the next guy and get a double play.” Margevicius has a different approach to this. Whatever he needs to get into the proper mindset and execute his pitches, then so be it. I always enjoy talking to Nick, as he has a definite love for the game and a thirst for the art of pitching.